Ausflam Fire Systems offers annual fire inspections and certification of compliance to passive fire protection products. Ausflam Fire Systems provides annual fire safety inspections and services for all passive fire protection products. Our services include annual fire inspections and certifications for commercial, industrial, and residential applications. All of our products come with a certificate of compliance once installed to assist you with getting your building passed and certified through your local council. To maintain compliance for your facility, we recommend establishing a regular inspection cycle to ensure all products that have been supplied and installed to your building have been installed correctly and are in good, safe working order that comply in all respects with the Australian standards. All of our inspections are carried out by qualified personnel and all services and inspections provided meet the applicable Australian Standards. Please contact us with the details of your systems that need inspection and we will be more than glad to assist you. Passive fire protection systems are as important as active modes of fire safety. In case of fire, passive fire protection systems hold the fire back, not allowing it to spread on to other parts of the building. This provides valuable extra time for fire fighters to carry out evacuation and rescue work. Non-fire rated doors and windows get damaged under the influence of extreme temperatures and allow bursts of air into the fire, causing it to burn more aggressively. So, carry out fire safety inspections in your building; if you don’t have passive fire protection systems in your building, it is best to quickly contact a fire protection systems expert before a disaster suddenly occurs. Ausflam Fire Systems is a company dedicated to providing passive fire protection systems. You can rely on us for any requirement of fire rated doors, windows and frames, as we provide a wide range of stylish fire rated products that also comply with the Australian standards of appropriate fire resistance. We also offer timely fire safety inspections on all our products to make sure that all your passive fire safety systems are working in perfect condition. We offer a wide range of options on our frames so that you can choose the best suitable product from our list. Along with that, we also offer both insulated and non insulated fire rated windows for passive fire protection of your building. Our fire rated sliding doors use a counterweight and pulley mechanism which provides durability and a fire rating level from 2 hours to 4 hours along with a certificate of compliance. All the products provided by us can be made to order and are completely customisable according to your requirements. Due to this flexible customer service, we are renowned as one of the leading passive fire protection providers in Sydney. We offer regular annual fire safety inspections and certificate of compliance on all our products. Along with our products we offer services like annual fire inspections and certification for all our commercial and residential applications. To ensure safety and to maintain compliance, we recommend that you maintain a regular annual inspection cycle. The fire safety inspections are conducted by highly qualified professionals, who make sure that all the installed products are in top working condition. 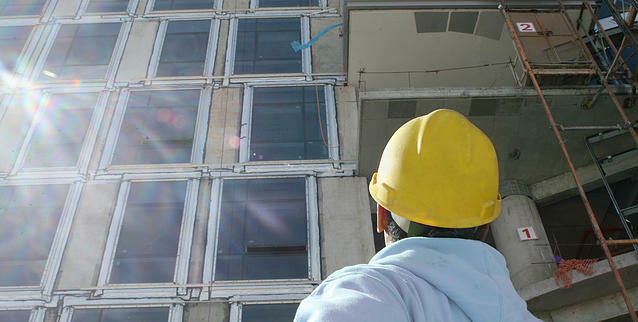 Inspections are also very essential to spot out any major damage on any of the products, which can lead to fire risks. We also offer a certificate of compliance on all our newly installed products, which will assist you with getting your building certified through the local council. Our inspection and certification services are highly valued by our customers due to the punctuality ad customer service displayed by our experts. At Ausflam Fire Systems, we take special care that all the products are customised, delivered and installed according to your requirements. Over the last 25 years we have been providing high standards of quality and customer satisfaction to our customers, along with timely inspections to ensure their safety. So, if you require any of our services or if you just want us to carry out fire safety inspections on all passive fire safety systems in your building, feel free to call us anytime on 02 9725 356. You can also choose to contact us via email through the Online Contact Us Form and we will revert within the shortest possible time.